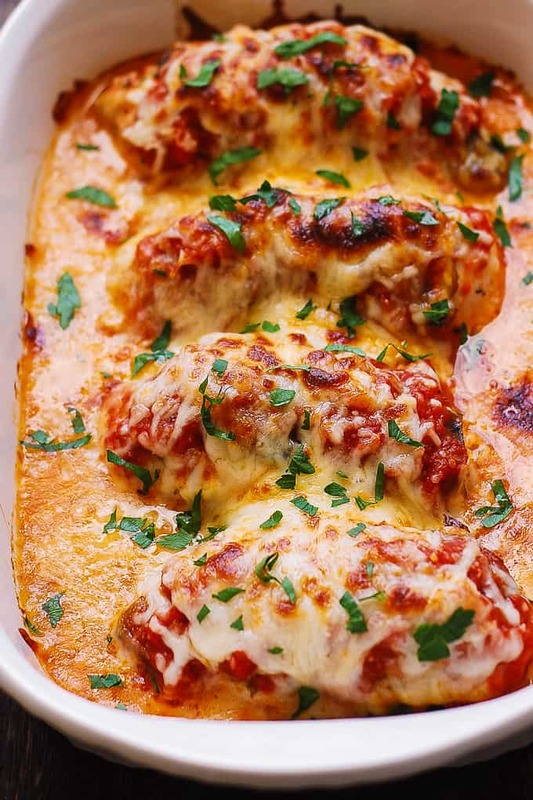 Easy Baked Mozzarella Chicken with Mushrooms and Tomato Sauce is a simple one-pan dinner! This low-carb and KETO friendly recipe is made without breadcrumbs. Easy and quick meal that a whole family will love! Chicken Breasts are smothered in marinara sauce with melted Mozzarella cheese on top. Chicken and Mozzarella make such a great combination! Take a look at pesto mozzarella chicken bake! This baked chicken with tomato sauce is juicy, cheesy, and bursting with flavors! And, it’s easy to make. Only 10 minutes of prep and 30 minutes of baking. It’s the best recipe for busy weekdays! The saucy chicken topped with melted Mozzarella cheese will add a variety to your family dinner menu! Easy cooking technique. Making this cheesy chicken bake could not be easier! Throw everything in a casserole dish and bake! Flavorful and moist chicken. This is the best recipe for cooking the juicy and saucy mozzarella chicken ever! Flexible recipe. Make your own marinara sauce or use a store-bought one. Use Mozzarella or Parmesan or Asiago Cheese. You can use skinless boneless chicken breasts or chicken thighs. Low-carb dinner. The recipe uses ingredients that are low in carbs. Chicken breasts, Mozzarella cheese, and mushrooms are all low-carb. 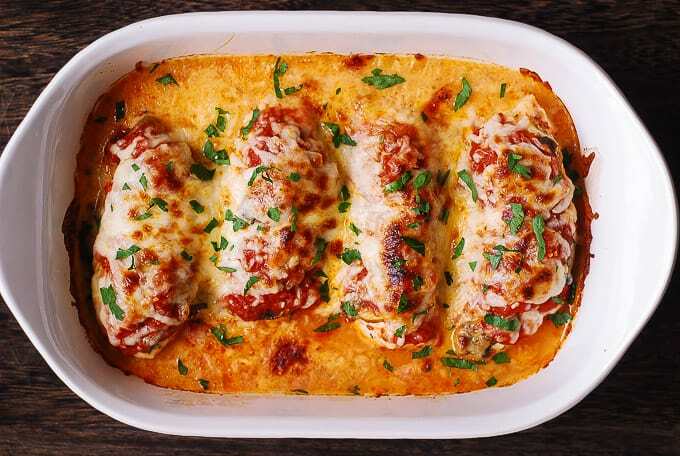 This baked Mozzarella chicken is made without breadcrumbs. High in protein. This recipe is packed with protein (chicken). One-pan meal. Everything is baked in one baking dish. Use a deep baking dish or casserole pan. Only one pan to clean! Only 4 ingredients. All you need are chicken breasts, tomato sauce, mushrooms, and Mozzarella cheese. Plus seasonings: Italian seasoning + salt. 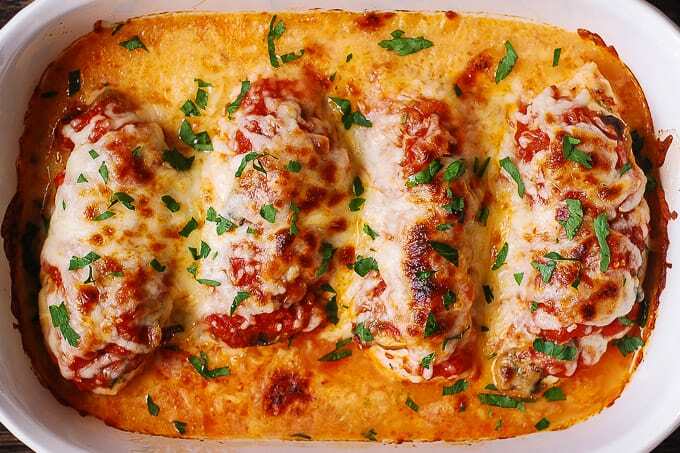 These simple ingredients make the best mozzarella chicken bake ever! 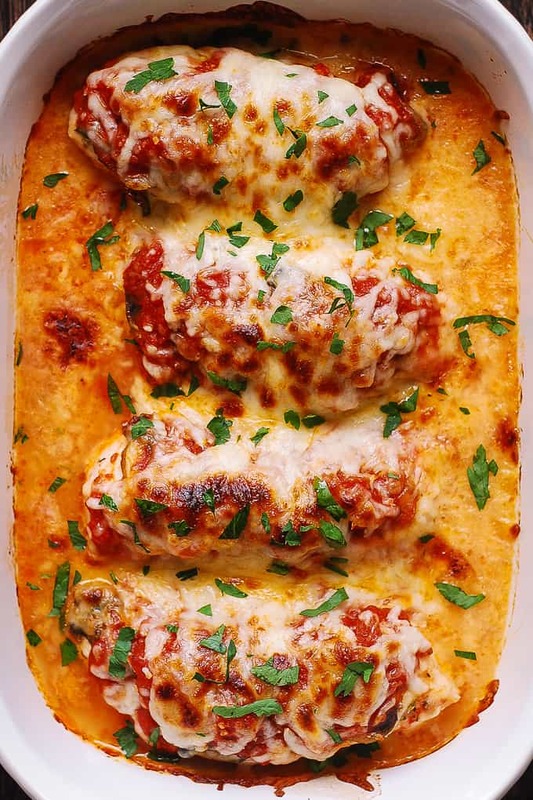 The best part of this recipe is a bubbly melted Mozzarella cheese on top of the baked chicken. 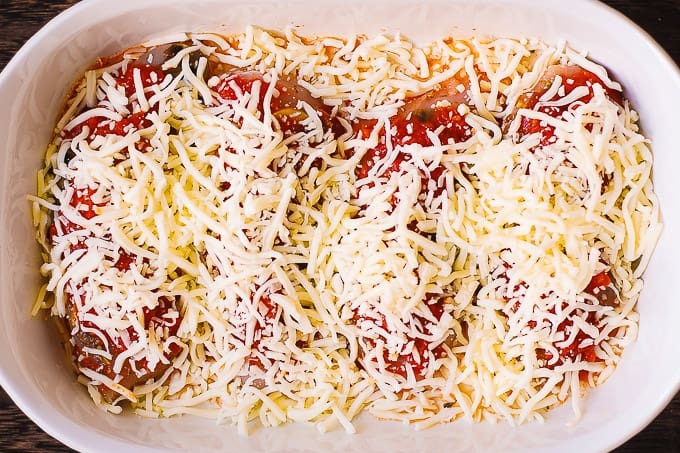 Broil the chicken with marinara sauce and cheese during the last 3-4 minutes of baking. Broiling will make Mozzarella cheese bubble. It will create a beautifully crisp, cheesy golden crust over the baked chicken. This recipe works with either skinless boneless chicken breasts or chicken thighs. Use homemade tomato sauce or store-bought marinara sauce. Any of these cheeses will work: shredded Mozzarella, Parmesan, Asiago, or Pecorino Romano cheese. This recipe uses regular button mushrooms. You can also try shiitake mushrooms or oyster mushrooms. 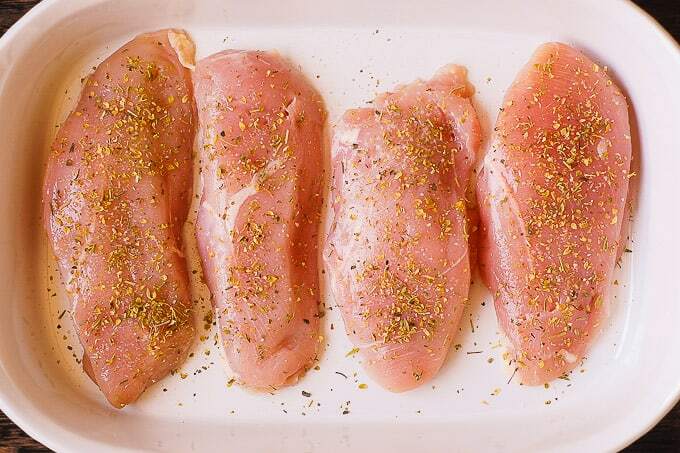 The total cooking time depends on the thickness of the chicken breasts. The thicker the chicken breasts, the longer the baking time. Below are step-by-step photos and instructions. 2) Add skinless, boneless chicken breasts to the casserole dish. Season the chicken with Italian seasoning and salt. 3) Top each chicken breast with sliced mushrooms. 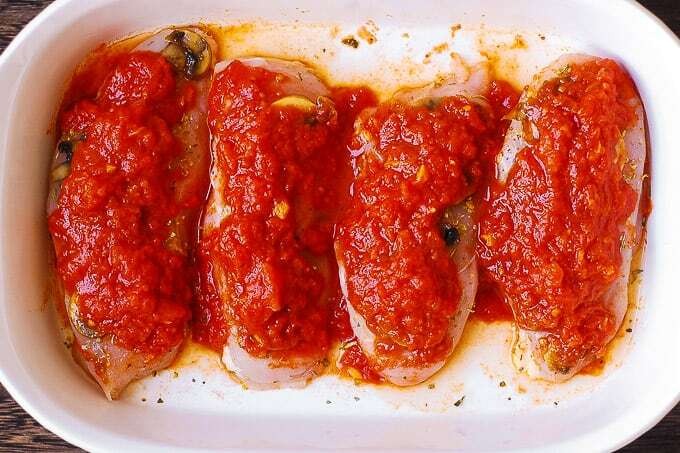 4) Pour marinara sauce over the chicken breasts. 6) Bake, uncovered, for 25-30 minutes, until the mozzarella chicken with marinara sauce is cooked through. Then, broil for the last 4 minutes if desired. 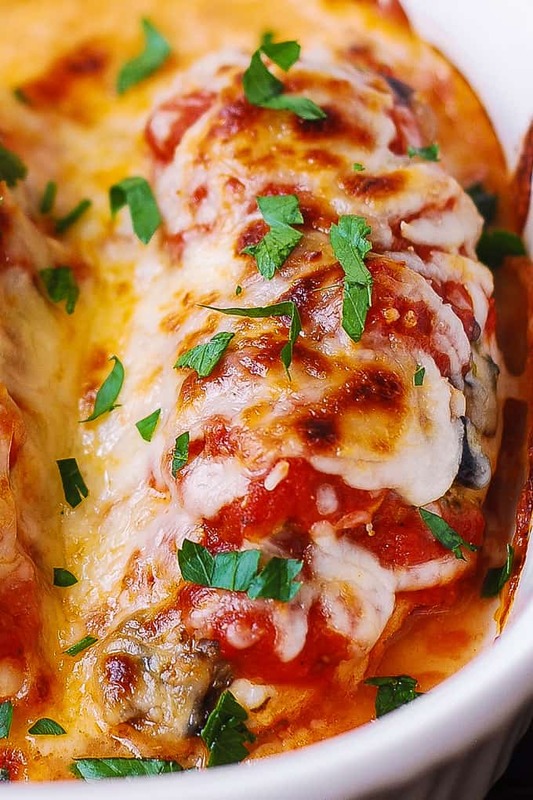 Easy Baked Mozzarella Chicken with Mushrooms and Tomato Sauce is a simple one-pan dinner! This low-carb and KETO friendly recipe is made without breadcrumbs. Only 4 ingredients + seasonings, 10 minutes of prep, and 30 minutes of baking time. Chicken is smothered in marinara sauce with melted Mozzarella cheese on top! Season chicken breasts with Italian seasoning and salt. 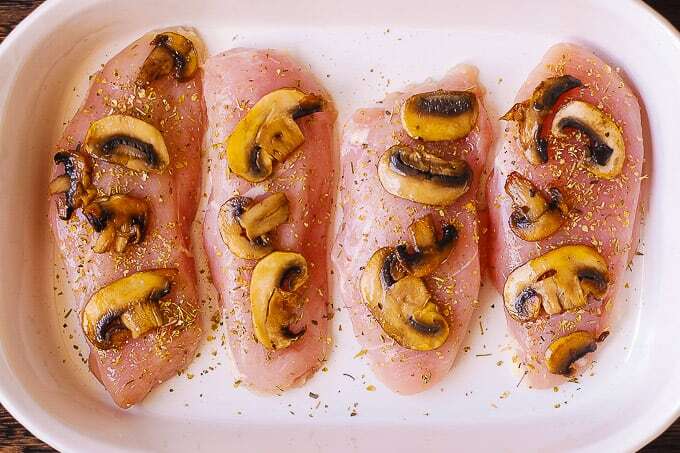 Top each chicken breast with sliced mushrooms. Pour marinara sauce evenly over the chicken. If you don’t want to use mushrooms, you can use thinly sliced small bell peppers or sliced zucchini or both. Take a look at these 2 recipes and how I used small bell peppers and zucchini – you can use both of these veggies in this recipe. Love how simple this is! Made this today with Parmesan cheese. Served over spaghetti. Yum!